Our red round tomatoes are a true show-stopper, and ours have the glossy red outside and tender inside our customers expect. Baywater Farms red round tomatoes are the perfect picture of what a traditional tomato should be, although we’re hoping that you’ll eat them instead of just looking at them! Red round tomatoes can be used in any cuisine you could imagine and look great on any spring or summer plate. Baywater Farms sells our red round tomatoes in bulk or 20 lb. flats. Our red round tomatoes are available throughout the summer season and are one of the best ways to bring a little summer sun to your CSA members or restaurant customers. The delicate and sumptuous tomato is used throughout global cuisines including Italian, Mediterranean, American, and Mexican. Tomatoes reduce for a sauce ideal for slathering on pizzas or tossing pasta in, and can be simply sliced and seasoned for a garden-fresh treat. Our red round tomatoes also work beautifully in soups, stews, and salads. The ideal red round tomato is slightly firm to the touch, glossy, and deep in color. If a red round tomato is hard, it needs extra time to ripen before it is ready for consumption. When you smell a ripe red round tomato, it should give off a delightful sweet fragrance. To store harvested red round tomatoes, keep them at room temperature and away from sunlight. Ensure that the red round tomatoes are not touching each other, or it will hasten the spoiling process. 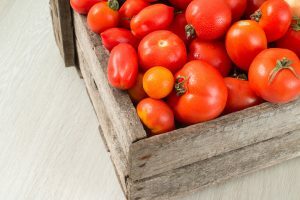 Eat fresh red round tomatoes within a few days or use them to make pasta sauce, tomato paste, crushed tomatoes, or diced tomatoes that you can can for a taste of summer in the depths of winter. Baywater Farms is passionate about cultivating sustainable produce with love and care in the same soil that our great-grandparents tilled. On our sixth-generation family farm, all of our heirloom and sustainable produce is grown using high-quality seeds that yield gorgeous, colorful, and delicious results. We use ecologically-friendly farming methods and are dedicated to preserving the provenance of our seeds, re-introducing historical crops, and supplying everyone in the area with locally grown produce with a conscience. You can find our fresh red round tomatoes in national grocery store chains, produce distribution companies, roadside farm stands, local farm-to-table restaurants, CSAs, and farmers’ markets. To learn more about ordering our fresh local produce, click here. We offer ordering 7 days a week, so don’t be afraid to call and ask if you have a special request or need your tomatoes picked straight from the vine and delivered to your doorstep. Our excellent sustainably grown produce speaks for itself, and we know your taste buds will love to listen!